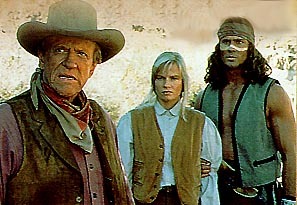 Gunsmoke: The Last Apache aired on CBS on March 18, 1990. To whom was the movie dedicated? Amanda Blake, who had recently died of Aids. (T/F) A total of ten made-for-TV movies were premiered in the season when Gunsmoke: The Last Apache was first aired. 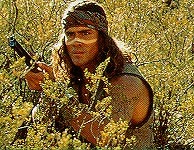 Gunsmoke: The Last Apache had the highest ratings of ten. False ... it finished number 7. How many stars did TV Guide give to Gunsmoke: The Last Apache? In Gunsmoke: The Last Apache, Dillon learns that he has a daughter. What is her name? Beth. The mother, named Mike, was played by Michael Learned who, in a Gunsmoke episode, played Matt's lover when Dillon had amnesia. Does Dillon's daughter ride side saddle? 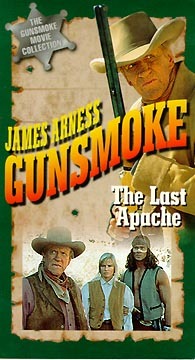 According to Leonard Maltin, Gunsmoke: The Last Apache is a patent reworking of the movie The Searchers starring whom?